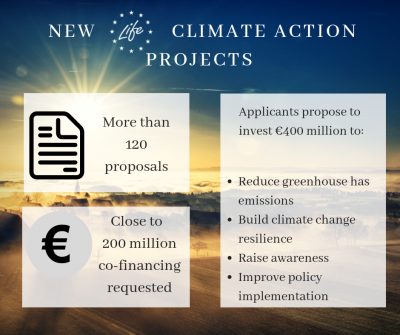 Applicants have submitted 124 proposals for traditional LIFE projects under the Climate Action sub-programme in the 2018 funding round. The deadline for applications was Wednesday 12 September. Half (62) of the proposals are for Climate Change Mitigation projects, with 51 for Climate Change Adaptation projects and the remaining 11 for the Climate Governance & Information (GIC) strand. Proposals have been submitted by organisations in 21 EU Member States, with 27 countries potentially benefitting in total (including three non-EU nations).